While Richard Dadd continued to work on his masterpiece The Fairy Feller’s Master-Stroke (1855-64), he completed several other paintings, in both watercolour and oils. Richard Dadd (1817–1886), Christ Rescuing St Peter from the Waves (1852), watercolour on paper, dimensions not known, Victoria and Albert Museum, London. Image courtesy of and © Victoria and Albert Museum, London. 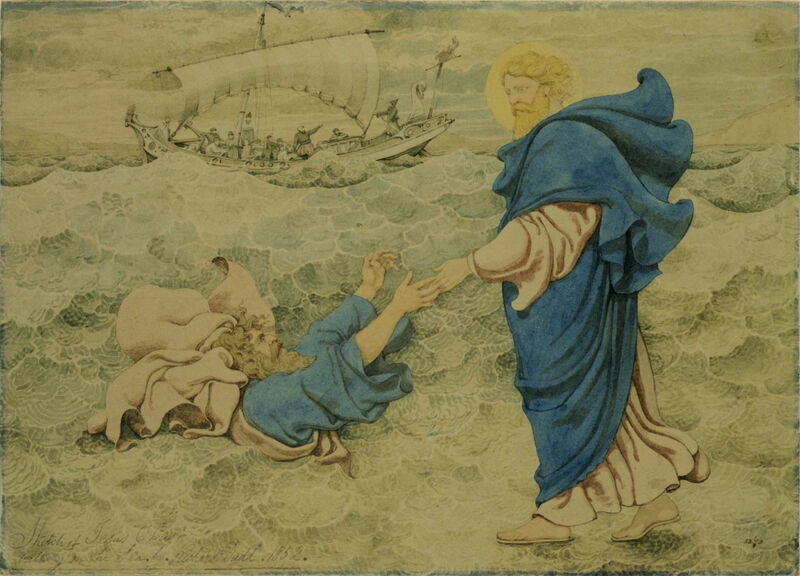 I should have included Dadd’s watercolour of Christ Rescuing St Peter from the Waves (1852) in an earlier article in this series, but it serves here as a reminder of his mature style towards the end of his first decade living in a secure institution. This is drawn from the popular New Testament story in which Jesus walks on water, but Peter almost drowns when he does so then becomes afraid. This painting shows Dadd’s wonderfully textured water surface. Richard Dadd (1817–1886), Fish Market by the Sea (c 1860), oil on canvas, 100.3 x 125.7 cm, Yale Center for British Art, Paul Mellon Collection, New Haven, CT. Courtesy of the Yale Center for British Art. Fish Market by the Sea, from about 1860, is an oil painting in complete contrast to The Fairy Feller’s Master-Stroke which he was working on at the time. 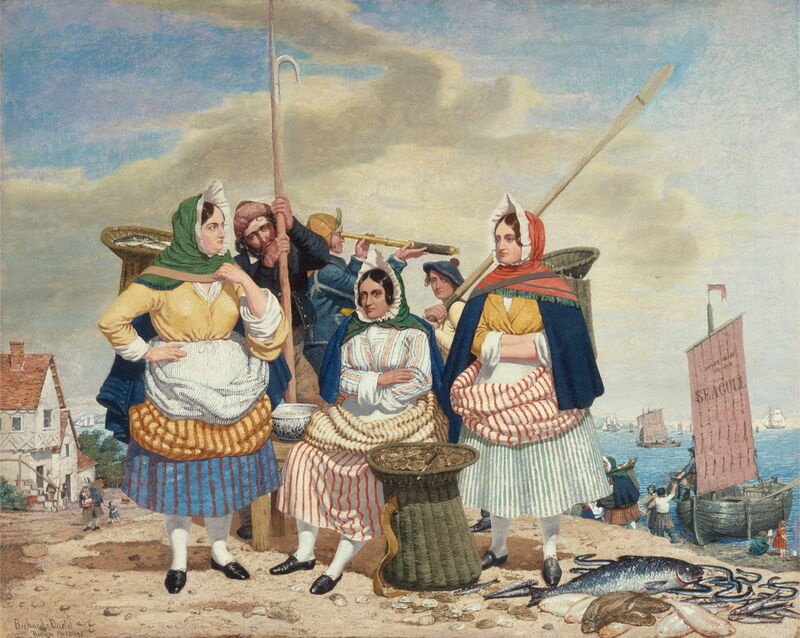 It shows an impromptu open-air fish market, run by the fishermen’s wives, to sell their husband’s catch as soon as it had been landed. Dadd’s light handling of his paint is more typical of a watercolour destined for use as an illustration – a market now closed to Dadd, but being exploited successfully by his former friend and fellow member of the Clique, William Powell Frith (1819-1909); by this time Frith was a Royal Academician and earning more than £1000 for a painting. Dadd’s painting appears to contain some visual quotations, notably the figure at the back of the main group, who is staring intently through a telescope. His limited access to models, particularly women, has resulted in a uniformity of figures: the three women seen closest to the viewer are almost identical. Richard Dadd (1817–1886), Negation (1860), oil on canvas, 50.8 x 34.3 cm, Yale Center for British Art, Paul Mellon Collection, New Haven, CT. Courtesy of the Yale Center for British Art. 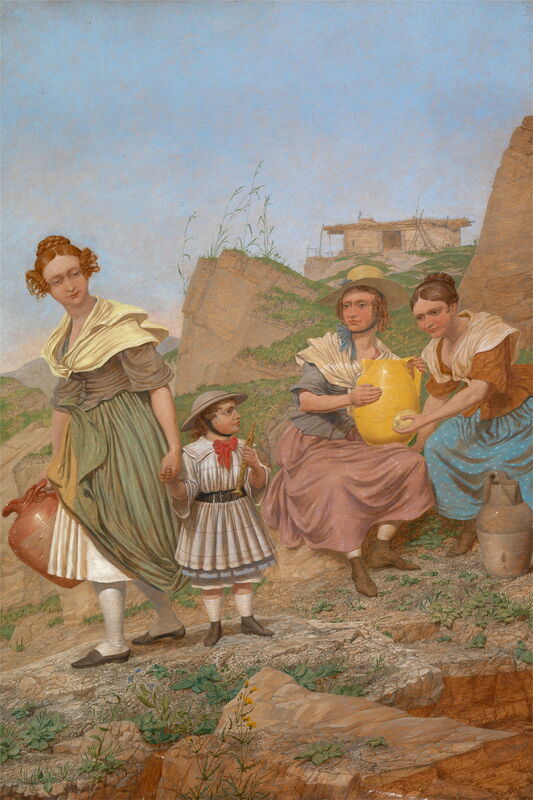 Negation, another oil from the same year, appears to have been inspired by some of the scenery which Dadd would have recalled from his travels in the Mediterranean, most probably the island of Rhodes. Again the three women are almost identical, differing most in the styling of their hair. The woman at the right is offering the little girl a potato (or possibly a fruit), but the girl’s mother is intent on walking her away. This reading seems too thin for the painting, and Dadd may be referring to a more complex story which remains obscure. Richard Dadd (1817–1886), Sailing Ships (1861), oil on panel, 19.7 x 53.3 cm, Yale Center for British Art, Paul Mellon Collection, New Haven, CT. Courtesy of the Yale Center for British Art. Dadd continued to paint occasional works showing ships, including Sailing Ships, an oil painting dating from 1861. This appears to be set on the English Channel coast. The plain views of the vessels, most seen broadside on, may reflect that by this time he was working from prints rather than his visual memory. The sea has an unusual tesselated surface. 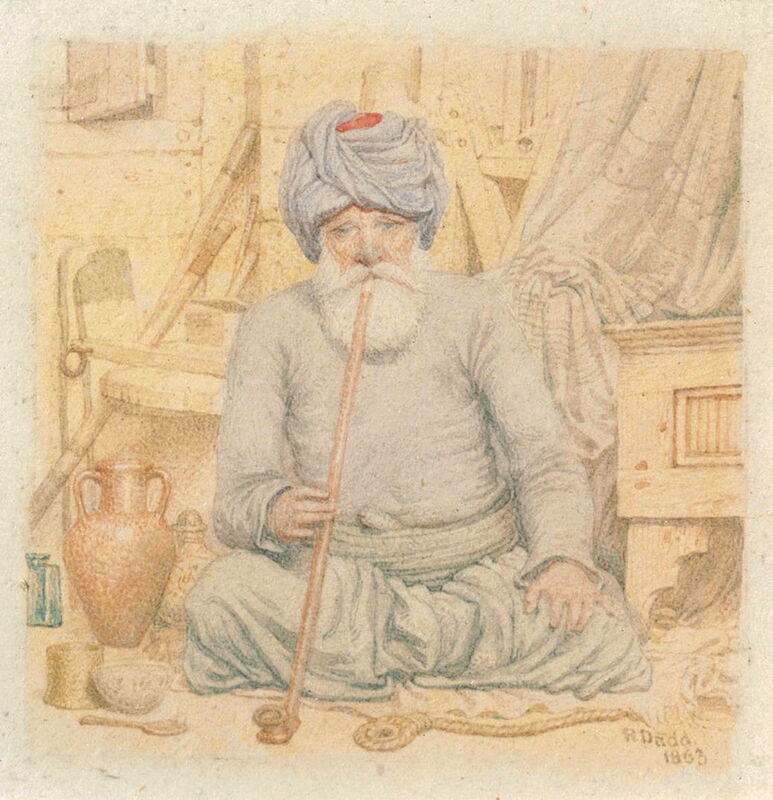 From time to time, Dadd seems to have dipped into his sketchbooks and brought to life an image from his travels of twenty years earlier, such as this watercolour of A Turk (1863). Richard Dadd (1817–1886), Eastern Letter Writer (1863), watercolour with brown ink on medium, smooth, beige wove paper, 48.6 × 36.5 cm, Yale Center for British Art (Gift of Michael D. Coe, Yale MAH 1968), New Haven, CT. Courtesy of the Yale Center for British Art. 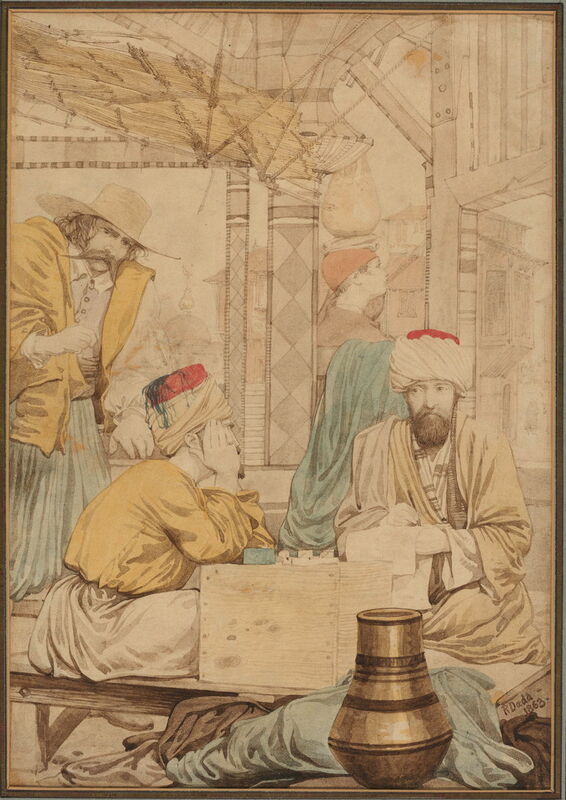 An even better example is this more elaborate watercolour of an Eastern Letter Writer from the same year. At its heart is a sight that Dadd would have sketched when in the Middle East: a man writing a letter as a business service to another. To that, he has added more incongruous buildings and figures, such as the moustachioed villain at the left, who is reminiscent of figures in his previous paintings. This gives the whole work a slightly surreal touch. Legislative reforms of the 1850s were catching up with Bethlem Hospital and its residents. In 1863, the first purpose-built state Criminal Lunatic Asylum was opened at Broadmoor, in the Berkshire countryside not far from Reading. The buildings on that 53 acre site were completed progressively over the period to 1868, and in 1864, Richard Dadd was moved there by train – his first excursion outside an institution since he had arrived at Bethlem twenty years earlier. With his move to Broadmoor, Dadd gained light, space, and countryside. But he also lost his privileged status, which at Bethlem had kept him in more genteel company and accommodation; once at Broadmoor, he was back with all-comers to begin with. Gradually, conditions improved as Dadd and his friends were able to keep to themselves more, but the move must have been a cause of great disturbance and distress. Richard Dadd (1817–1886), Landscape Composition (1873), watercolour on paper, 30.5 x 42.5 cm, Victoria and Albert Museum, London. Image courtesy of and © Victoria and Albert Museum, London. 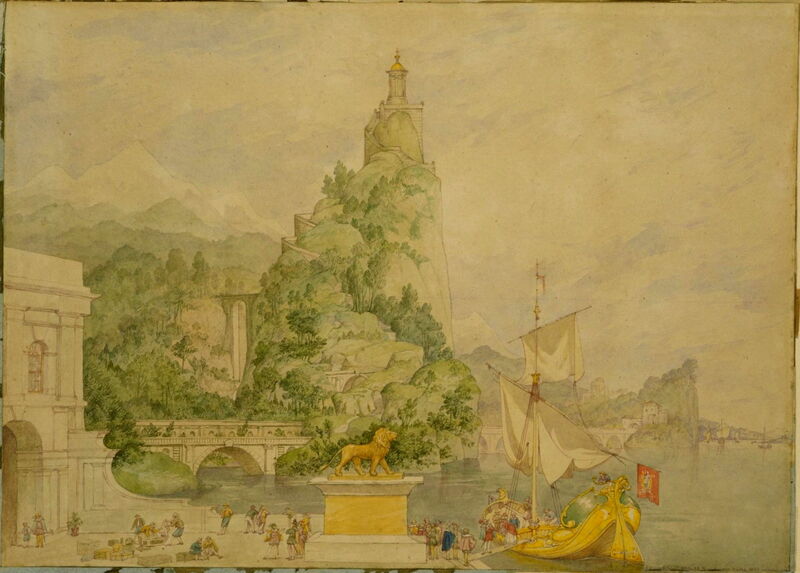 Landscape Composition is a watercolour study intended for a drop-scene to be used in the theatre at Broadmoor in 1873. It is set in a fantasy Mediterranean coastal landscape, with wooded hills rising quickly to snow-covered peaks in the distance. A ship is neither moored nor fully alongside a quay, colourful figures crossing its gangplank. There are extensive classical buildings and bridges, a large golden statue of a lion, and a vertiginous pinnacle, on top of which is a viewpoint. This was part of a substantial project which Dadd started in 1872, to decorate the stage of Broadmoor’s central hall, used periodically for entertainment. This earned him his own studio at last. Richard Dadd (1817–1886), Leonidas with The Woodcutters (1873), watercolour on paper, 18.2 x 13.1 cm, Victoria and Albert Museum (Bequeathed by John Forster), London. Image courtesy of and © Victoria and Albert Museum, London. 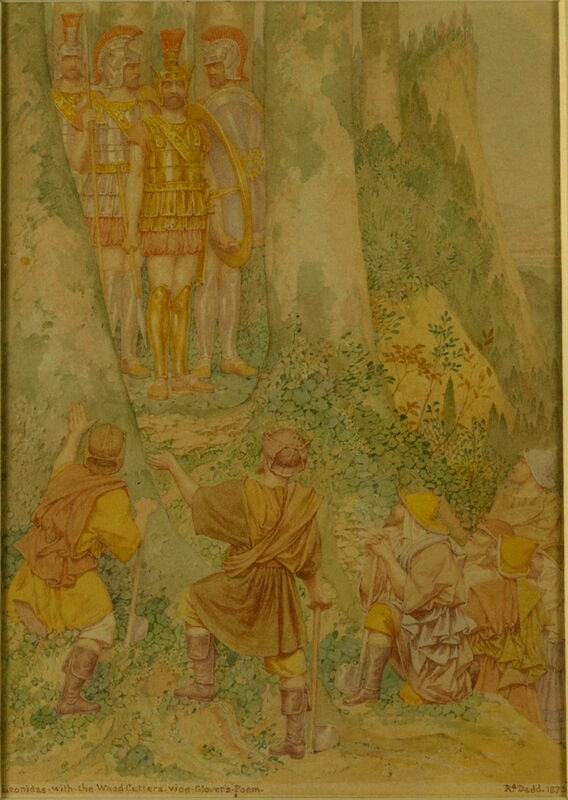 Leonidas with The Woodcutters, from 1873, is a narrative watercolour based on an epic poem by Richard Glover, which was first published in 1737 in nine books, and later extended to twelve. It is based on the life of King Leonidas I of Sparta, who died in 480 BCE in the Battle of Thermopylae. The story is complex, and derives from the prediction of the Delphic Oracle early in the second Persian War. This was that the Greeks must either lose their country or one of their kings to the Persians. Leonidas, King of Sparta, decided that his death at Thermopylae would therefore save his country. King Kodros of Athens, hearing about the prediction, went out dressed as a woodcutter, and picked a fight with some Spartan soldiers, who killed him. Thus both Athens and Sparta were saved as a result of the deaths of their kings. Dadd shows the party of woodcutters as they are deliberately confronting the Spartan soldiers, to ensure that Kodros was killed, thus that Athens was spared. Richard Dadd (1817–1886), Landscape with Cottages, Broadmoor (1873), watercolour, gouache, and graphite on medium, slightly textured, beige wove paper, 24.8 x 37.8 cm, Yale Center for British Art, Paul Mellon Collection, New Haven, CT. Courtesy of the Yale Center for British Art. 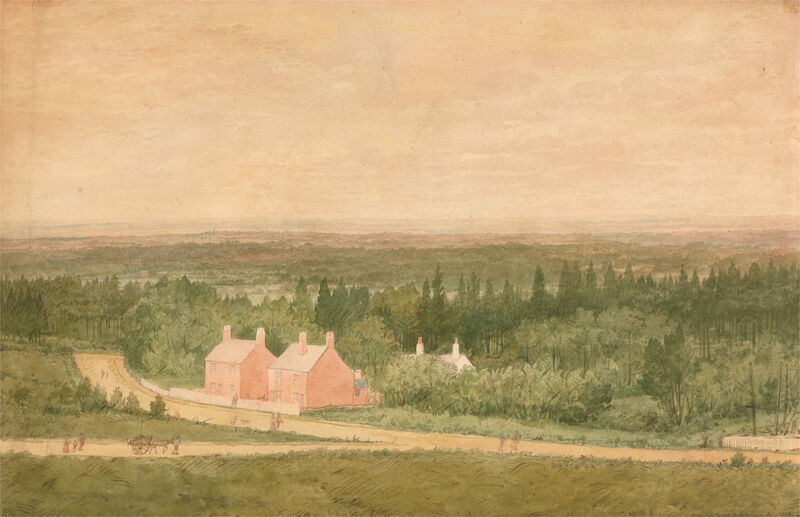 Dadd’s watercolour view of Landscape with Cottages, Broadmoor from 1873 is probably the only landscape painting which he made from the motif, since he had returned from his travels in Europe and the Middle East. It shows the featureless wooded plain which then surrounded the Broadmoor site. 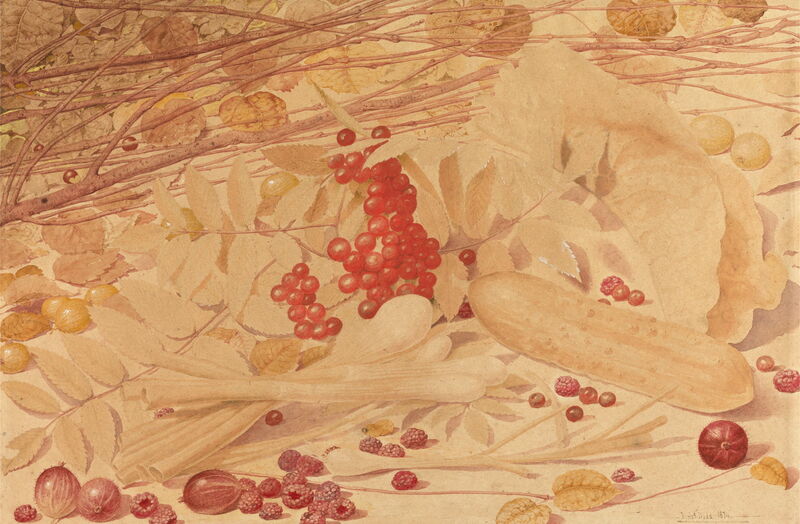 Richard Dadd (1817–1886), Still Life with Gooseberries, Raspberries, Red Currants, Spring Onions, a Gherkin and Foliage (1874), watercolour and gouache on medium, slightly textured, beige wove paper, 25.1 x 37.8 cm, Yale Center for British Art, Paul Mellon Collection, New Haven, CT. Courtesy of the Yale Center for British Art. Situated in the country, Broadmoor grew its own produce in a twelve acre kitchen garden, and Dadd’s watercolour Still Life with Gooseberries, Raspberries, Red Currants, Spring Onions, a Gherkin and Foliage, from 1874, would have been painted from some of that produce. Wandering Musicians, from about 1878, is believed to have been Dadd’s last oil painting. 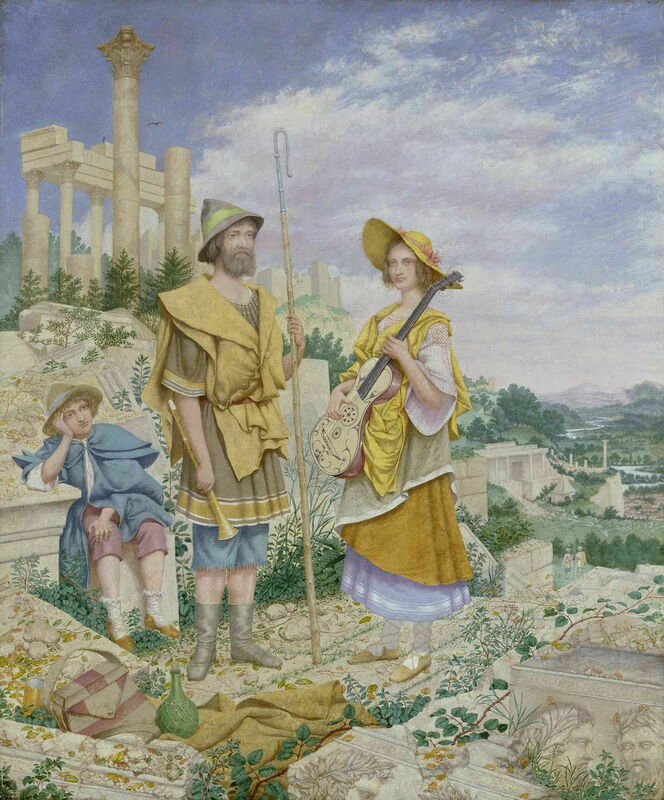 It shows an itinerant couple and their son among gently overgrown ruins of a classical building, above a town most probably in the Mediterranean. The two musicians are intended to be pifferari, typically Italians who wandered from festival to festival as a lifestyle, playing distinctive folk music. JWM Turner had earlier painted pifferari, in his Modern Italy – the Pifferari (1838). However, meticulous research by Patricia Allderidge has uncovered a deeper reading. The fragments of frieze in the foreground bear the names of Bion, Moschus, Tyrtaeus, and Theocritus – ancient Greek bucolic poets. One of Dadd’s close friends during his institutional life was William Chester Minor, an American surgeon and etymologist who was contributing to the first edition of the Oxford English Dictionary. The story of Minor and the dictionary is told in Simon Winchester’s book The Surgeon of Crowthorne. Minor apparently had a copy of Theocritus’ poems in English translation, to which Dadd would have had access. In that volume, the Seventh Idyll describes a shepherd on the Greek island of Kos, which may explain the crook being held by the man, and this unusual setting. Dadd made a watercolour copy of this painting, which he inscribed with the title Italian Rustic Musicians. 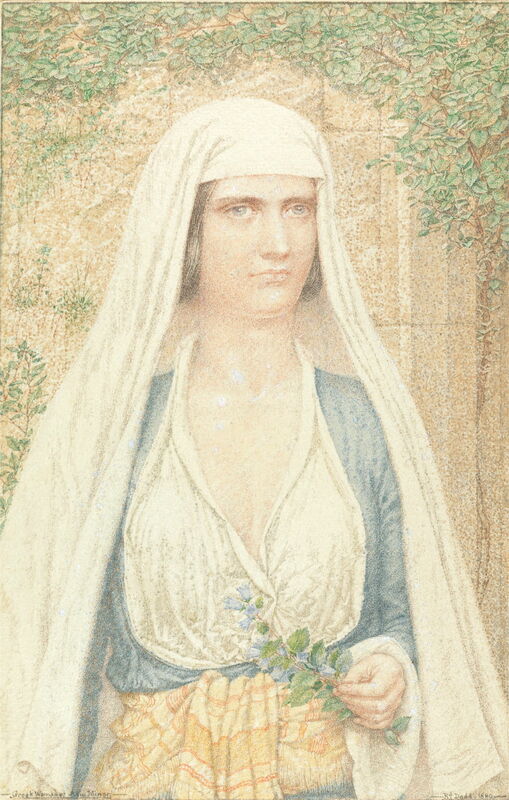 Richard Dadd (1817–1886), Greek Woman of Asia Minor (1880), watercolour over graphite, retouched with gouache on moderately thick, rough, cream wove paper, 29.2 × 18.7 cm, Yale Center for British Art, Paul Mellon Collection, New Haven, CT. Courtesy of the Yale Center for British Art. Although he seems to have ceased working in oils after 1878, Dadd continued to paint a few watercolours, including this Greek Woman of Asia Minor (1880), who appears to have been based on his earlier travel sketches. One problem during the early years of Broadmoor was outbreaks of typhoid among staff and patients, which was caused by a contaminated water supply. As Dadd aged prematurely from his institutional existence, he suffered from typhoid in 1868, and never fully recovered. In 1885, he developed tuberculosis, and his health deteriorated more rapidly. He died in Broadmoor on 7 January 1886, at the age of 68.